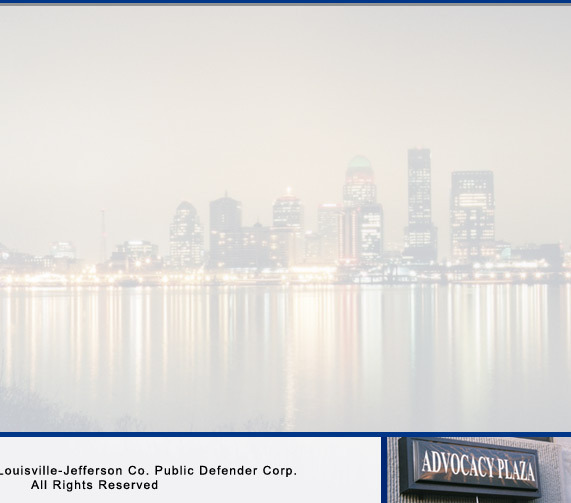 The Louisville-Jefferson County Public Defender Corporation offers you the opportunity to be a litigator at an established and recognized public defender office. Our professional accomplishments and the results we have achieved for our clients in the trial and appellate courts speak for themselves. Find out how you can join our outstanding staff. As a member of our staff, you will also be living in a vibrant city and a great geographic location. Louisville Metro is the largest city in the state and the 16th largest in the nation. It is situated on the Ohio River, and the downtown area is anchored by a newly restored riverfront park and entertainment center. The city itself developed outward from the river and around a beautiful metropolitan parks system designed by renowned landscape architect Frederick Law Olmsted. Louisville is a city of many and diverse neighborhoods with wonderful and historic architecture, both residential and commercial. Cultural offerings are numerous and varied, including the Kentucky Center for the Arts, Actor's Theatre of Louisville, the Speed Museum of Art, the Louisville Orchestra, and the Louisville Science Center, among others. Louisville is also home to the 3-time NCAA Champion University of Louisville Cardinals basketball team coached by Rick Pitino, Churchill Downs and the Kentucky Derby, the PGA Championship Valhalla Golf Course, the Louisville Slugger Baseball Museum, and the Muhammad Ali Center. Louisville Metro is consistently ranked at or near the top in national surveys measuring cost of living, quality of life, and best places to work, play and reside.